The Roads & Transport Authority (RTA) has announced the timing of various services to be delivered during Eid Al-Adha holiday at Customer Service Centers, paid parking zones, public buses, Dubai Metro, marine transit modes, driving schools & institutes, and vehicles testing & registration centers. Detailing the above, Dr. Aysha Al Busmait, Director of RTA Marketing & Corporate Communication, said: “All Customer Service Centers will be off during the Eid holiday starting Thursday 25 October and resume duty on Monday 29 October. All paid parking zones in Dubai Emirate will be free of charge except for the parking of the Fish Market and multi-level parking lot from 25 to 29 October. “RTA will extend the metro service hours during the Eid in Dubai events, which started on October 18th and continue till November 2. Today Wednesday, October 24, trains start operation from 05:30 am on the Red Line, and at 05:50 am on the Green Line, and continue operation up to midnight. On Thursday October 25, the metro will start operation at 05:30 am on the Red Line, and 05:50 am on the Green Line and continues operation up to 04:00 am on the next day. On the first day of the Eid, Friday October 26, both lines will start passenger service at 10:00 am and continue service up to 04:00 am. On 27, 28 October trains will start running at 05:30 am on the Red Line, and at 05:50 am on the Green Line and both lines will continue operation up to 04:00 am on the next day. From 29 to 31 October, the Red Line will be operating from 05:30 am, while the Green Line will be operating from 05:50 am and both lines will continue running up to midnight. On November 1, both lines will continue service up to 04:00 am on the next day, and on Friday 2 November, all trains will offer passenger service from 10:00 am and continue service up to 04:00 am on the next day. 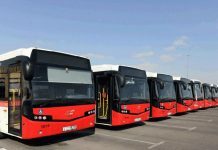 “The service timing of public buses during Eid ul-Adha holiday will be as follows: In public bus stations, including Main Stations such as Gold Souk, and Al Ghubaiba Stations, the public bus service will start at 06:00 am and continue up to 12:00 am (midnight) throughout the week. In Subsidiary Stations, such as Satwa, Al Qusais, Al Qouz Industrial and Jebel Ali Stations, the service will start at 06:00 am and continue up to 12:00 am (midnight). 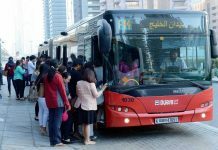 In the Metro Feeder Bus Stations, such as Rashidiya, Mall of the Emirates, Ibn Battuta, Abu Hail, Etisalat, and Burj Khalifa Stations, tomorrow (Thursday) the service will start at 05:50 am and continue up to 04:00 am. On October 26, the service will start at 10:00 am and continue up to 04:00 am. On 27, 28 October, the service will start at 05:50 am and continue up to 04:00 am. From October 29 to 31, the metro feeder bus service will start at 05:50 am and continue till midnight, whereas on November 1, the service will run from 05:50 am up to 04:00 am, and on Friday November 2, the feeder bus service will start at 10:00 am and continue up to 04:00 am on the next day. “The timing of the inter-city bus service will be as follows: Main Stations (like Ghubaiba) will remain operational 24 hours a day, while subsidiary stations (such as Sabkha, Union Square, Deira City Center and Karama) will be on duty from 06:00 am up to 12:00 (midnight). External stations (such as Sharjah – Jebel Ali) will be on service round-the-clock during the Eid holidays, while Sharjah (Jubail-Deira), Abu Dhabi, Fujairah, Ajman and Hatta services will start service at 06:00 am and continue up to 12:00 (midnight) throughout the week. “The working hours of marine transit systems during Eid ul-Adha holidays will be as follows: Water Bus from 07:00 am up to 10:00 pm, Ferry Dubai from 09:00 am up to 07:00 pm, and the Water Taxi from 10:00 am up to 03:00 am starting from tomorrow (Thursday) and during the first and second Eid days only. 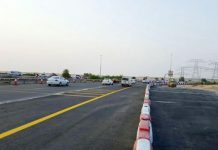 “Driving schools and centers, such as the Emirates Driving Institute, Belhasa Driving Center, and Drive Dubai, will be off from the first Eid day and resume service on Monday 29 October. Al Ahli Center will be off during the first Eid day only and resume duty on Saturday 27 October. Galadari Center will be off on the 1st and 2nd Eid days and is set to resume duty on the 3rd Eid day. “All vehicles testing & registration centers will be off starting tomorrow Thursday and remain closed for 3 days such that they resume duty on Monday October 29,” elaborated the Director of Marketing & Corporate Communication Sector.